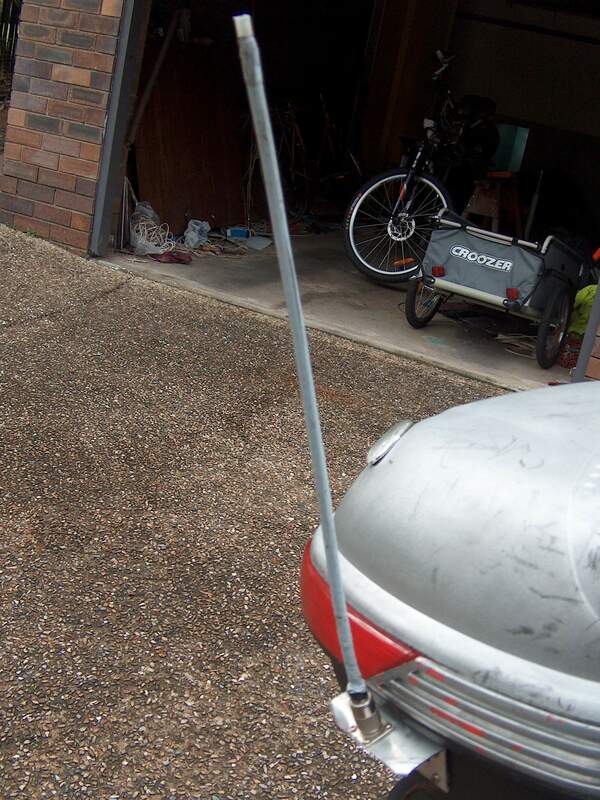 Over the last year or so, I’ve done a number of improvements to the bicycle mobile station. I’ve kept meaning to document what’s happened, as a number of people have asked about the station, and not everyone gets to see it up close. A big move was when the FT-290RII 25W PA died, I was using the FT-897D a lot, and that thing is a heavy lump of a radio to lug around. So I bought its smaller sister, the FT-857D with its remote head kit. A second move was from the heavy 40Ah battery pack to a much lighter 10Ah pack. Then, in July last year, I bought myself a new pair of wheels. The ’09 model Boulder pictured earlier still gets regular use and is good on the road, but longer trips and on hills, it’s a drag, and the tyres are not good on dirt. Thus I bought a Talon 29 ER 0… in contrast to the Boulder, this bike is designed with mountain-biking sports in mind, so a little heavier duty, better gearing and suspension. 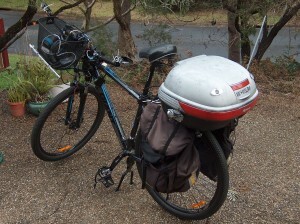 Sadly not dual-suspension … they don’t seem to make one that will take a pannier rack on the back like I require. Nonetheless, this one has been going well. Rather than buying an open basket like I did on the other, I went one step further, I bought a motorcycle hard top-box and mounted that on the back. Thus the FT-857D could live in there, sheltered from the weather. I later also bought pannier bags: my battery, some tools, spare tubes, visors for the helmet, etc, live in one bag, my clothes live in the other. The station is otherwise, not much different to how it was in concept. The antennas now mount on opposite sides of the top box with right-angle aluminium. I still have to work on grounding for the HF side but even then, the station still delivers respectable performance on 40m. On my way to BARCfest this year, I was being heard S9+40dB in Newcastle with 60W PEP. I’d have ran 100W, but due to the earthing problems, I found I was getting a bit too much RF feedback. The 2m antenna is similar to previous ventures, just a 51cm length of RG-213 with the jacket and braid stripped off and a PL-259 plug soldered onto one end. It’s a simple design that’s easy to make, easy to fix, cheap and can be constructed from readily available parts. If you can make your own patch leads, you can make one of these. 70cm remains a work in progress. In theory, a ¼λ antenna resonant at 144MHz should also resonate at 432MHz, as this is the ¾λ frequency. In practice, this has been a pain to tune. I basically just stick to 2m and leave it at that. As for coupling the radio to the head unit… I could use the leads that Yaesu supplied. One distinct disadvantage with this is that it ties me into using only compatible equipment. The other is that the connectors are just not designed for constant plugging/unplugging, and the 6P6C and 8P8C connectors become unreliable very quickly if you do this. A solution was to make up a patch lead to go onto each end, and to use some standard cable in the middle. Initially I did this with a 25-pin printer cable, but found the RF problems were terrible! Three lengths of CAT5e however, did the job nicely. Yes, I sacrifice one pin, right in the middle. 24 pins is more than enough. I allocate six pins on one end for the head unit cable; choosing the wires so that the connections are consistent at each end. The other end, I have a standard convention for microphone/control cabling. The balanced nature of the CAT5e works well for microphone cabling on a radio like the FT-857D which was designed with dynamic microphones in mind. The only other connectors I need then are for power, and for lights. Power I just use Anderson PowerPole type connectors, the 30A variety… and for lighting, I use ruggedised 6-pin automotive connectors. 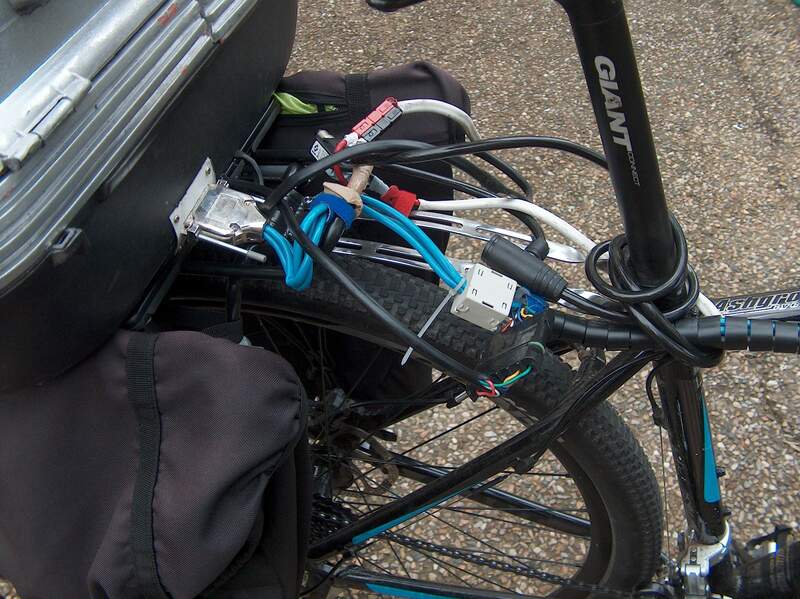 At the handlebars, things have been refined a little… the switches and push buttons are in plastic boxes now. 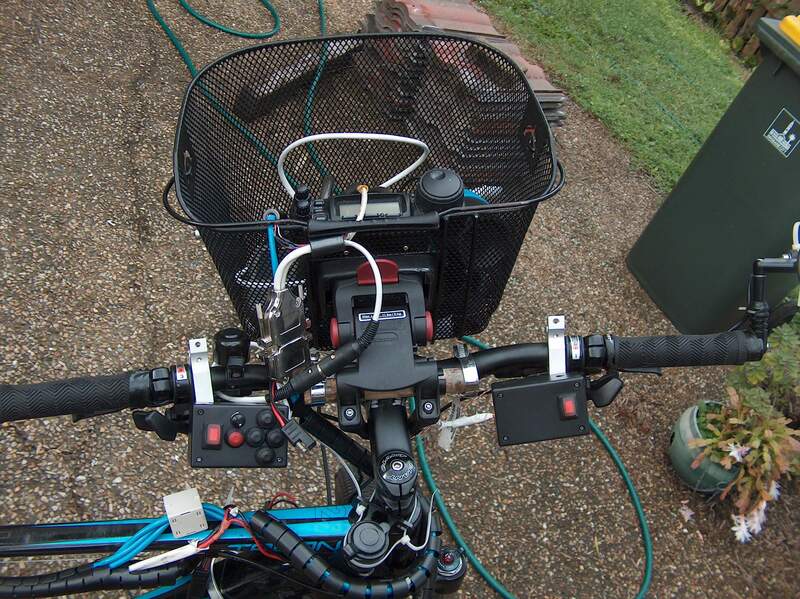 Here I still have to work on the front basket mount, this compromise of a former broomstick handle hose-clamped to the handlebars is a workaround for the basket bracket’s inability to clamp around the rather thick handlebars. This arrangement is fine until one of the hose clamps slips (which happens from time to time). For now I put up with it. The controls from the radio are now mostly on the left side… Since the rear gear shift and front brake are on the right-hand side, I do far more with my right hand than with my left. Thus doing this, I free up my right hand to actually operate the bike and use my less-busy left hand to operate the radio. 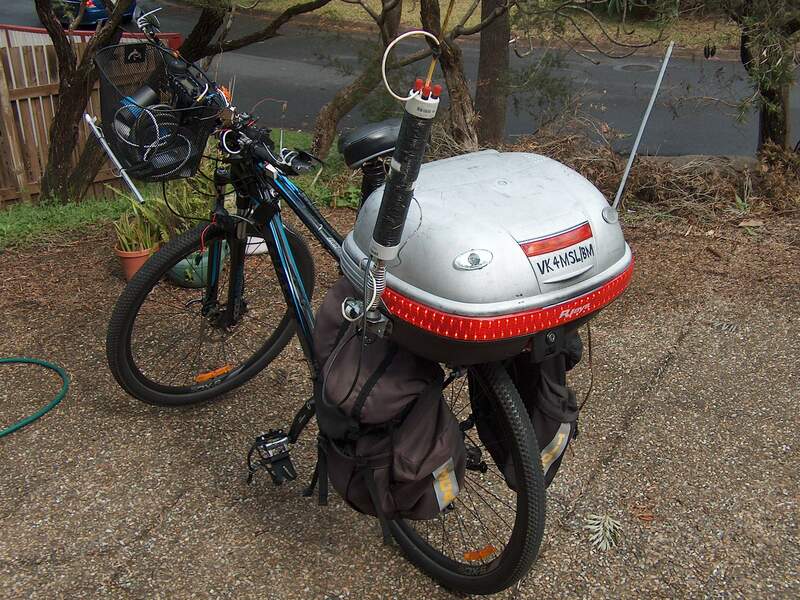 I mentioned earlier about HF… the HF antenna should look familiar. It’s actually the same one I’ve been using for a while now. Most distant contact so far has been into the Cook Islands on 20m. I’ve had successful contacts on 80m, 40m, 20m and 15m with this antenna. 10m and 6m are the two that elude me just now. It is a little difficult to see the entire antenna. I did try to pick the angle to show it best… but if you look above the tree, you’ll see the tip of it immediately above the top box. Below is a close-up shot to give you an idea where to look. It doesn’t look like much in the day time, but it is quite bright at night. The back uses two LED strips mounted in behind the red plastic on the top box, and one can easily read a book in the light produced. Looking in the rear vision mirrors at night, the red glow can be seen reflecting off objects for a good 100m or so. On my TO-DO list, is to mount switches to operate the brake light (just above the callsign). Options include reed switches, hydraulic switches in the brake lines, or strategic placement of micro-switches. I’ll have to experiment. The other electronics is in place. As to the other bike? It’s still around, in fact if you look at the photo of the VHF antenna, you can see it in the background… along side the trailer I use when I do my grocery shopping. 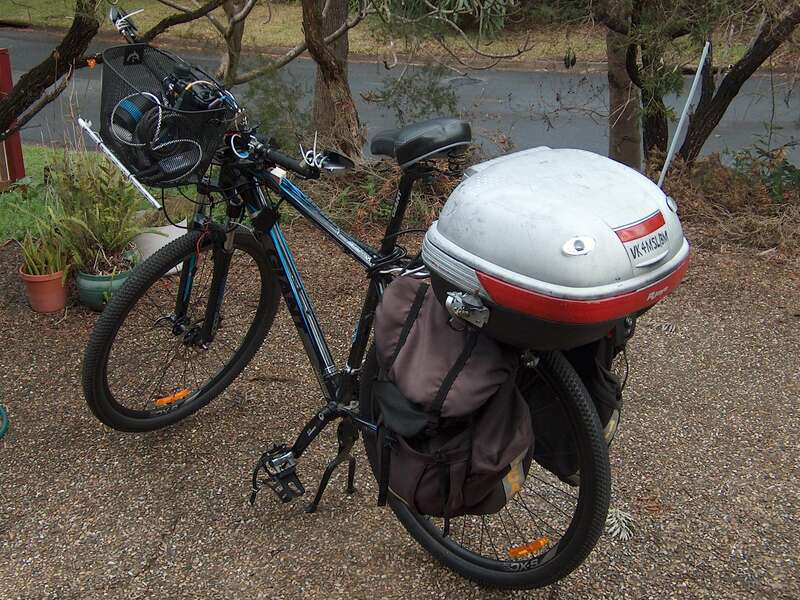 I’ve done away with the basket on it, and gotten a second mounting plate, so the same top box fits on the back of the other bike, along with the same pannier bags, and same front basket. It has done about 2800km since I bought the Talon (mid July, 2012), the Talon itself has done 2617km. 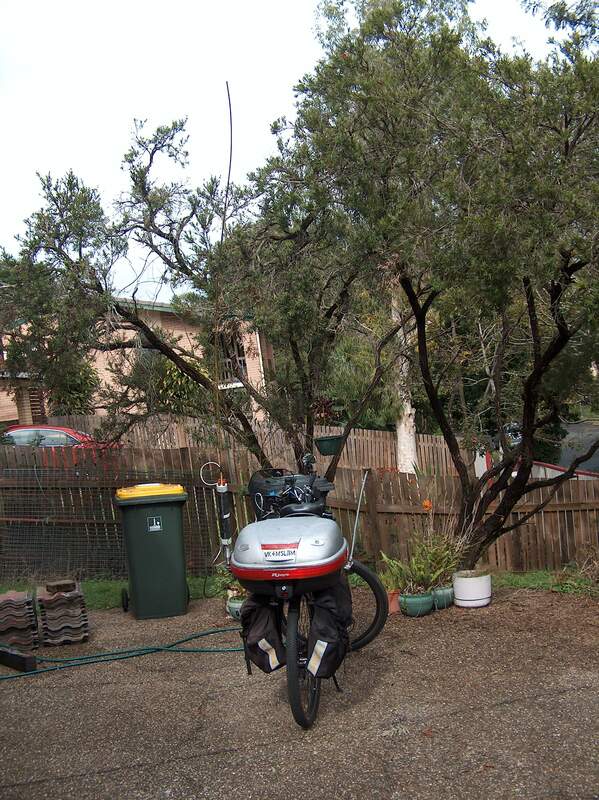 Thus I’d estimate the Boulder is well and truly past the 10000km mark, probably closer to 11000km now. 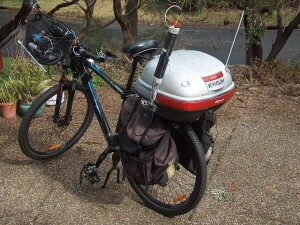 It’s still the primary means of getting around, averaging close to 100km a week and with a heavy load. Not bad for a bike that’s designed for a little recreational riding. Giving a hand Microsoft gone mental as anything?